I'm a huge Simone Elkeles fan. She writes one heck of a great teen romance. I've been waiting for something new forever. Wild Cards didn't disappoint. At first I thought this had a lot of similarities to Catching Jordan by Miranda Kenneally. You all know how much we loved that. Girl plays football, someone on team has a dad who plays in the NFL, hot boy plays football too, etc... But, really that is where the similarities end. They are very different stories. The only thing I didn't like was how hot and girly Ashtyn was. I mean, in the interests of reality a girl who plays football would probably be more of a tomboy or at least a little bit more muscle. Ashtyn was skinny and girly. Not that they can't be...but it just didn't fit in my mind. I know I'm being stereotypical but the stereotype is there for a reason! I couldn't wrap my head around it. I really loved this book. I read it in one sitting. I just devoured it. I loved Derek and Ashtyn's stories and how they came together. If you love Simone Elkeles then you know. She's just good! She'll do you right. Wild Cards is worth it. Has never read a book by this author, but maybe I should. All are saying that she is so very good. 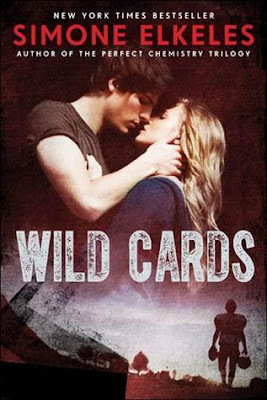 Ohhh, I can't wait to read Wild Cards! I'm glad you liked it because there seem to be a surprisingly large amount of people that said they were disappointed. Regardless, I'm definitely going to pick this one up at B&N! That is exactly what I was thinking when I read this novel! The similarities with Catching Jordan especially. A few people have been let down by this novel, but I'm glad you enjoyed it as much as I did!